Patience. With snowflakes coming down outside our window on an early April morning, our yoga instructor encouraged us to practice patience as we moved toward preparing for difficult poses like back-bends and twists for our practice. We needed to be limber, couldn’t push things. Be present. That advice rang true to me for more than my yoga session. The weather aside, a family member is recovering from surgery, and I practice patience as I watch him heal. It’s difficult to see him in pain. I want him to be his energetic and cheerful self right away, but of course he is not. My heart aches so I grow impatient. I get angry at myself in the process when all I want is to see the light at the end of this ordeal. One day at a time, I remind myself. Patience. It’s not coming easy this morning. But I am confident it will and the love I feel will overtake any sadness I experience during this process. 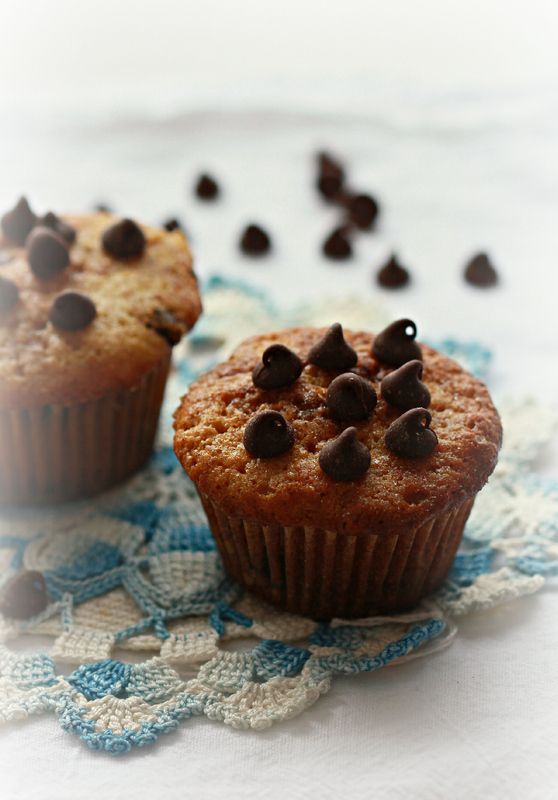 These Dark Chocolate Muffins are a good antidote to the winter-weather-in-spring. They’re a bit rich but small, so an affordable indulgence. Bits of bitter, dark chocolate are baked in a buttermilk batter then topped with cinnamon sugar for an unexpected flavor and crunch. The aromas that fill the house while they bake will serve to counteract the impatience we all feel as we wait for spring, or that you might feel given what challenges you face in your day. Enjoy them for a midafternoon snack, with a hot cup of coffee and a bowl of your favorite fruit. Watch the snow melt and any sadness you feel lift away. Note: Please watch for my next post in early May. Preheat oven to 350 degrees F. Line a 12-cup muffin pan with 12 paper liners. In the bowl of a standing mixer fitted with the paddle attachment, cream the butter and brown sugar until light and fluffy. Incorporate the eggs, one at a time, until they are fully mixed in. Add the vanilla. Beat again. Pause the mixer, then add the flours, baking powder, baking soda and sea salt. Mix on low, just until the dry ingredients are incorporated. Add the buttermilk, mix again, then add the dark chocolate chips. Mix one more time, briefly. 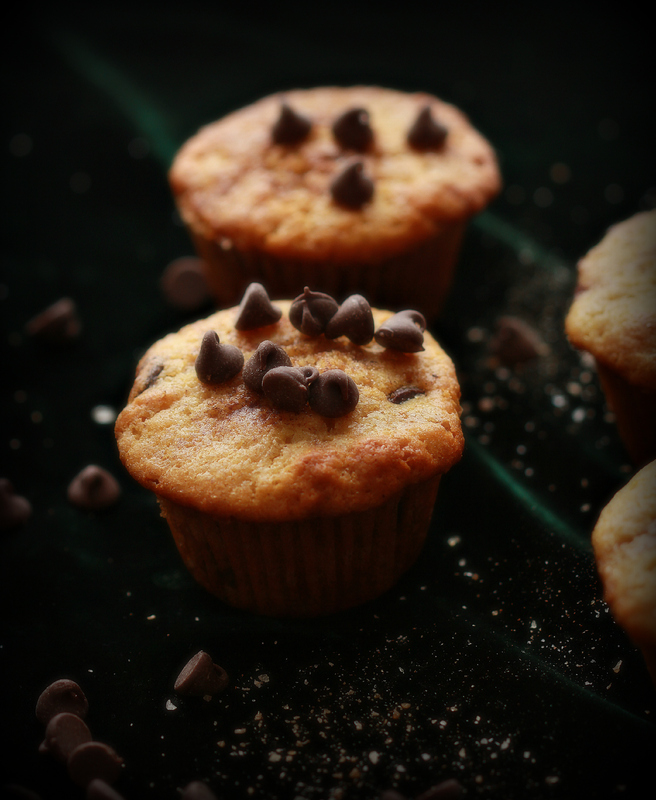 Fill the muffin cups with the batter. Sprinkle evenly with cinnamon sugar. 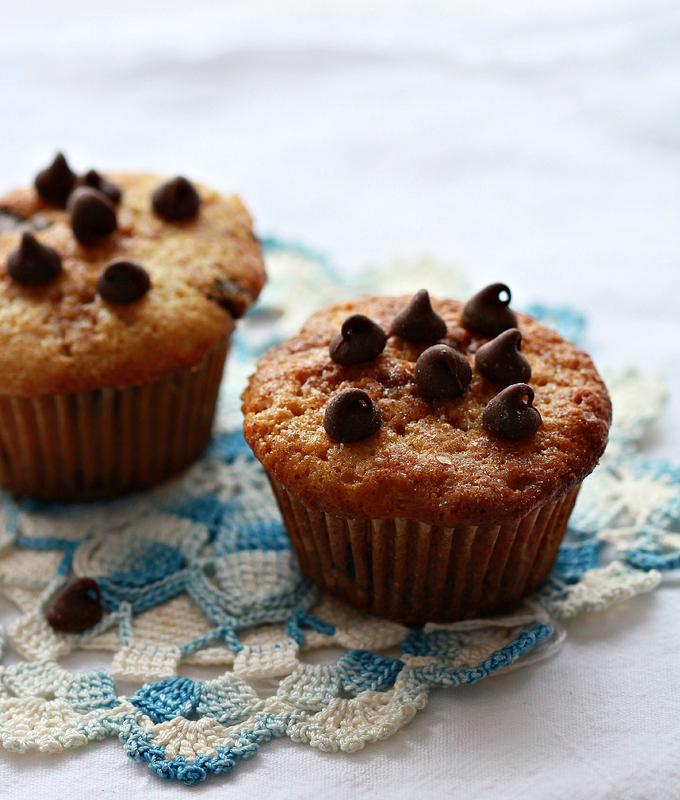 Bake until the muffins are browned and springy to the touch, about 25 minutes. Allow to cool slightly then remove from the muffin pan. This recipe is slightly adapted from Huckleberry: Stories, Secrets and Recipes From Our Kitchen by Zoe Nathan. For a gluten-free variation, use a combination of all-purpose gluten free flour and almond flour instead of traditional all-purpose flour and whole wheat flour. Add 1 teaspoon Xanthan Gum. 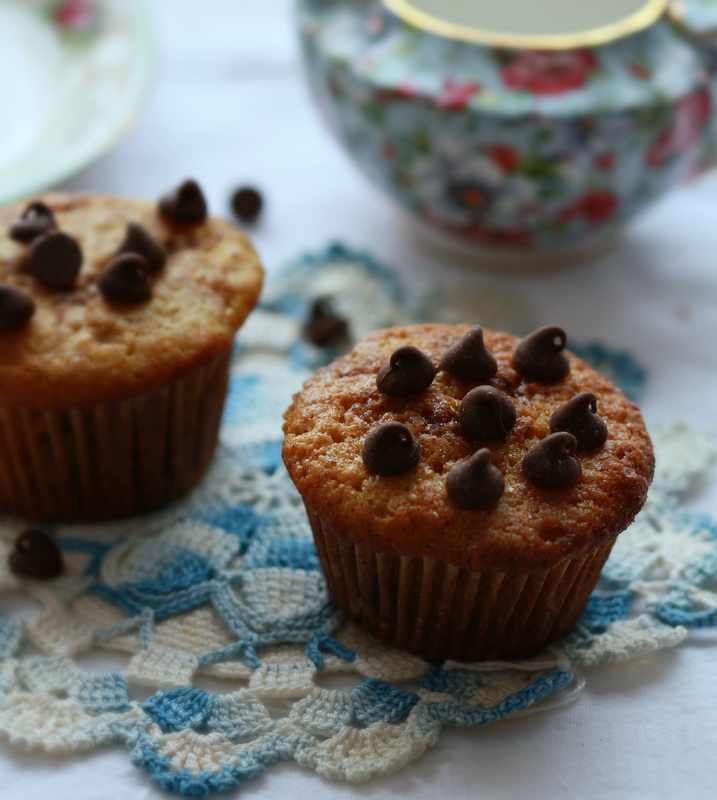 Enjoy these muffins for dessert with Strawberries Marinated in Wine and Honey. Or, for breakfast with a warm bowl of oatmeal, honey and sliced fresh fruit.